That was made by our host, Heather at Heather’s Bytes. Yum! Can’t wait to click on the links and see how these turned out! Just discovered what a short link is…oh and I LOVED these bagels! http://www.bakingandboys.com/2012/10/bagelstuesdays-with-doriebaking-with.html These turned out great. So glad I made them! 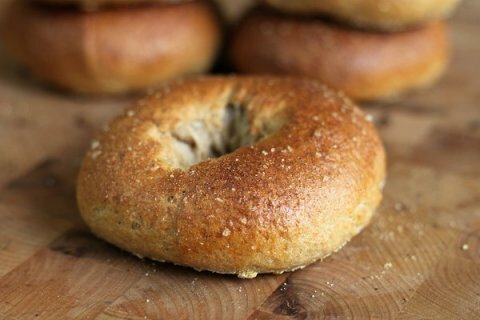 We absolutely adored everything about these Bagels! Very fun, and really good! We had fun with this, and we’re still enjoying them about a week later. I’ll do it again…but not until it cools off here. I loved making these yummy bagels too!! Tasty but a little tedious. my first Tuesday with Dorie, and I get to make something I’ve always wanted to make! Yay! Lots of work – but they were good! I baked bagels! What an achievement! The Green Chile and Cheddar Bagels were yummy! Yes I did make bagels! Time got away from me… here’s mine! Lots to clean up but well worth the time. Yum. Phew! I made it! Loved these! The first batch of 5 bagels were a semi-failure (I decided to shape them first), the second a success, after 3 days in the fridge. Weird, but I’ll take it. A lot of work for the humble bagel; I’m glad I made the journey though. First two were a near complete failure, re-grouped and rescued the dough. Part 1 of our gluten free version of Bagels. A work in progress. Stay tuned til Oct. 30 for Part 2, i.e. our final version. nearly 2 weeks late, but finally made them! I finally made the bagels but left the dough in the fridge for days. Not a good idea but steve made a great breakfast pizza so it wasn’t a total loss.